I've been making great progress on my mod sampler! 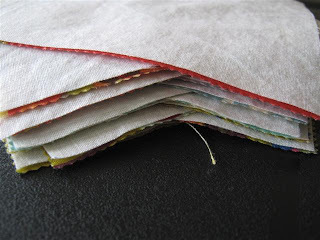 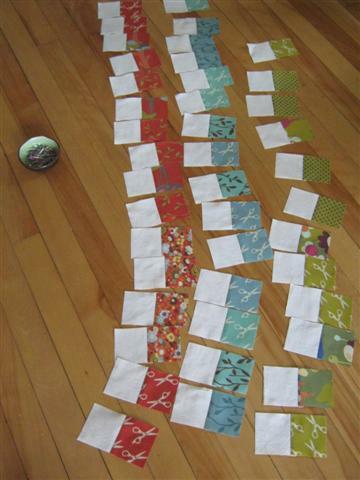 I took this rather boring picture, because spreading out the batting is one of my favourite parts of quilting, especially using natural fiber batting that feels so nice to brush my arms over and that sticks to the backing fabric. 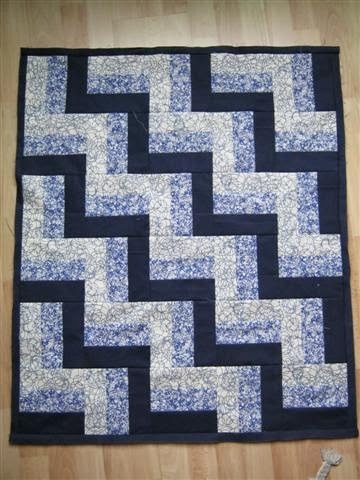 Aaah. 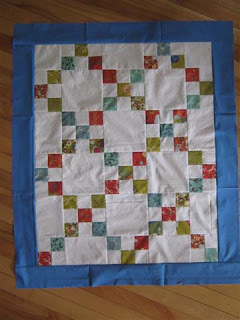 The quilt top looks so different before it's quilted! I finished the binding just the other day, that was a get-it-done-in-one-sitting-job... took about 3 hours, I think. 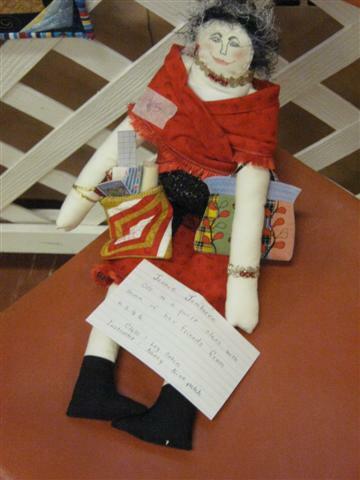 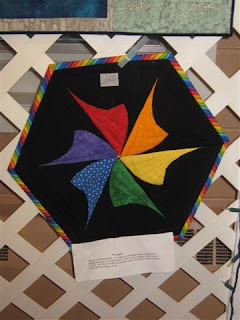 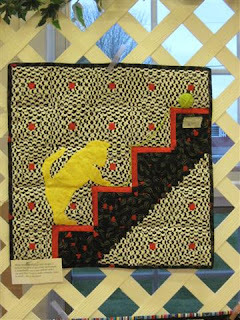 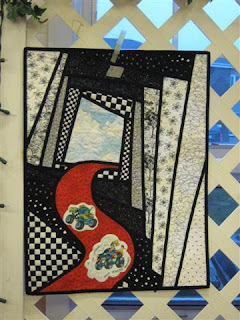 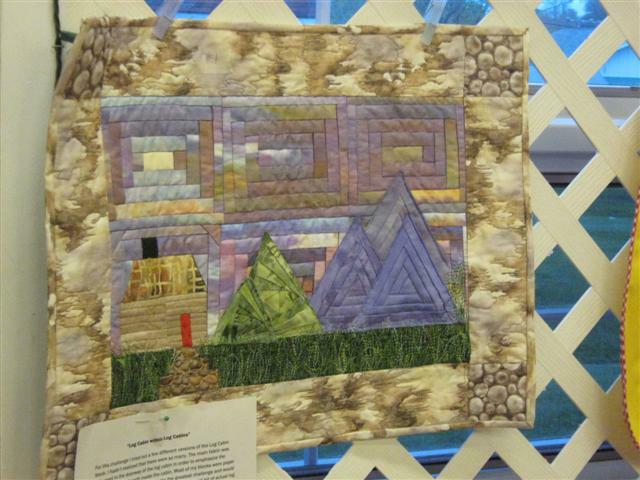 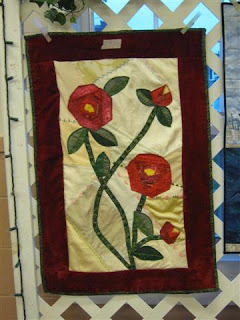 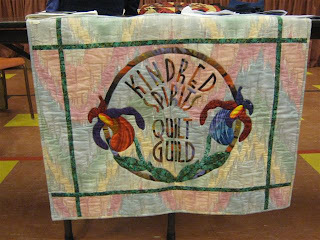 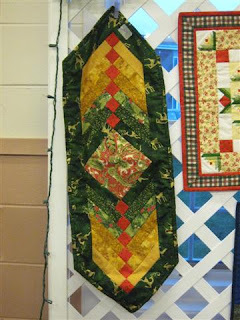 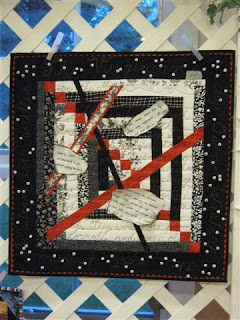 Ah, I'm so tired these days - too much computer work, but I just didn't want to miss the Blogger's Quilt Festival... so here's my last minute contribution. 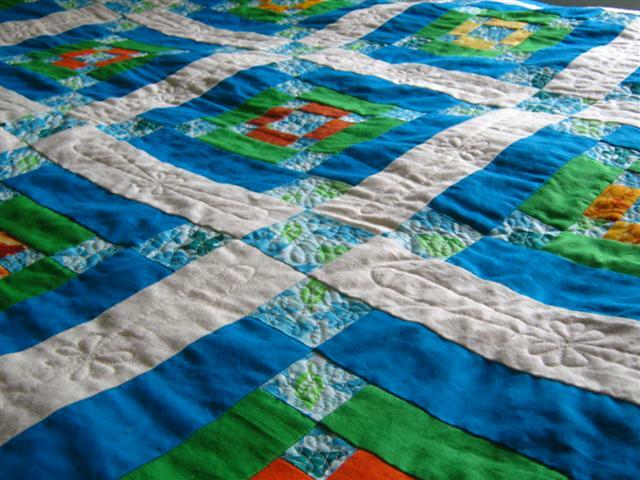 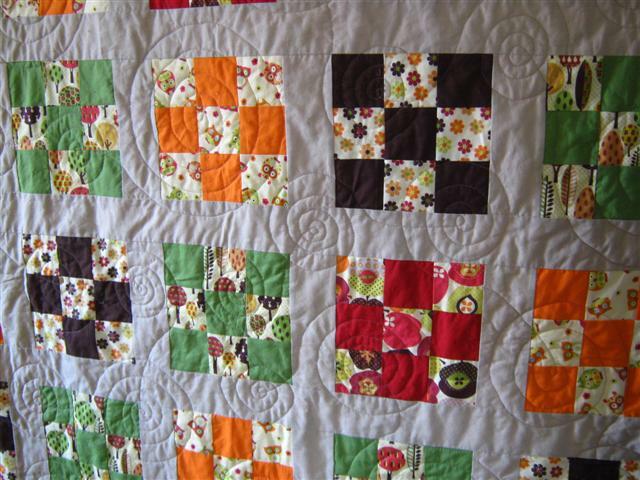 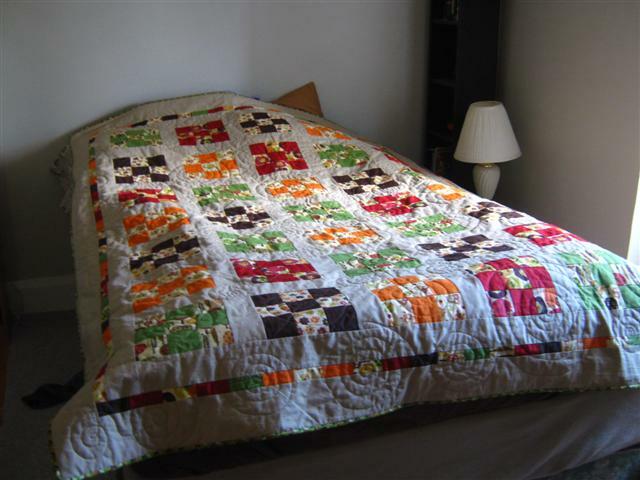 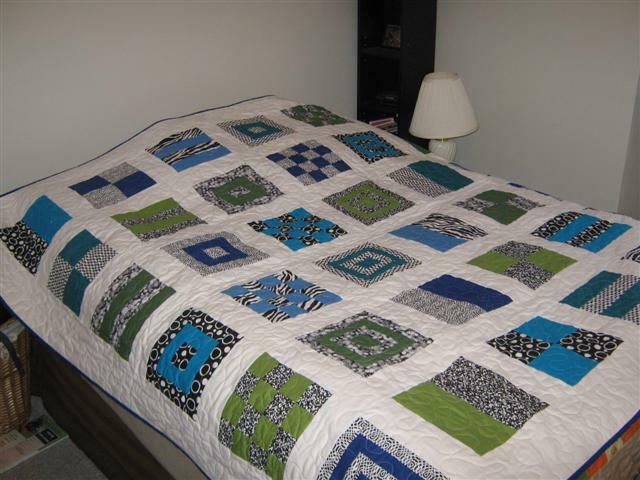 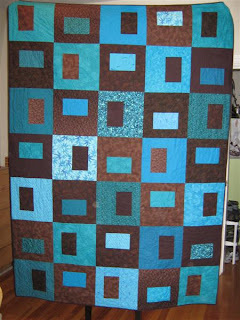 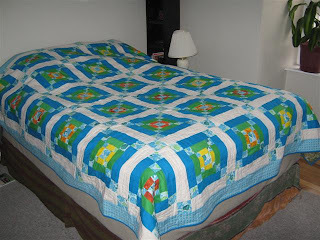 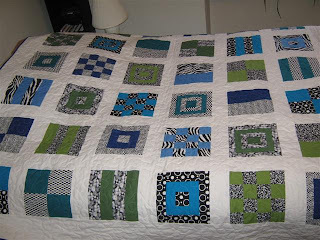 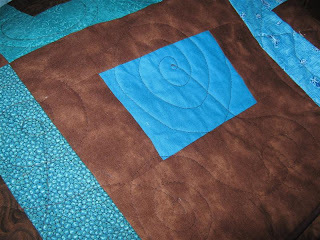 The first quilt that popped into my mind (apart from the very recent quilt finishes :) is the Brown and Turquoise Quilt I made for my best friend back home. 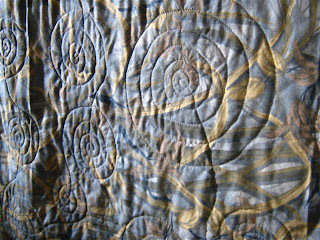 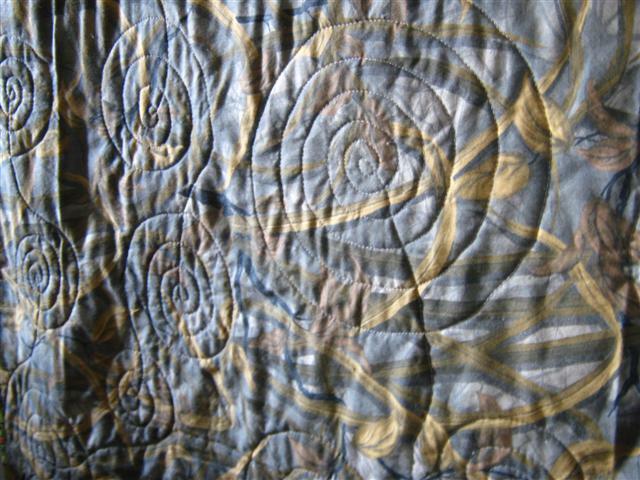 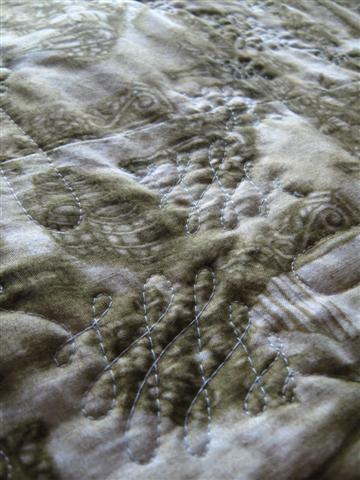 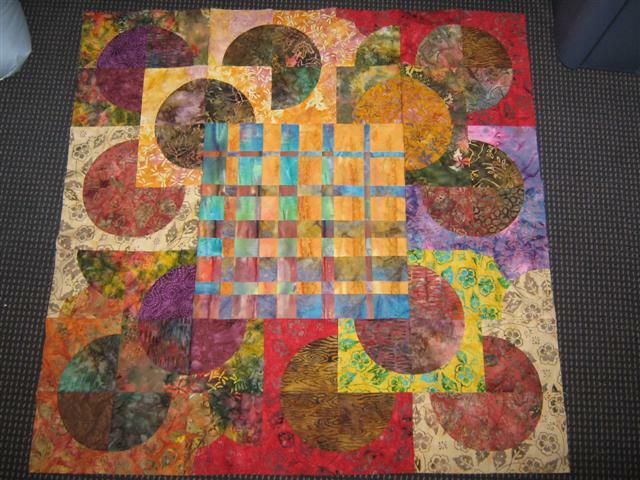 The quilting was also relatively quick: big BIG spirals all over the quilt. 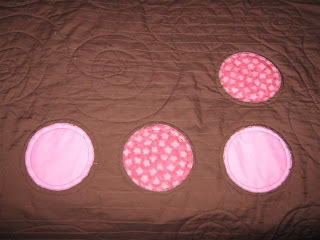 I really like how that pattern turned out and have used it again very recently. 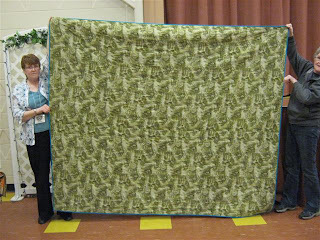 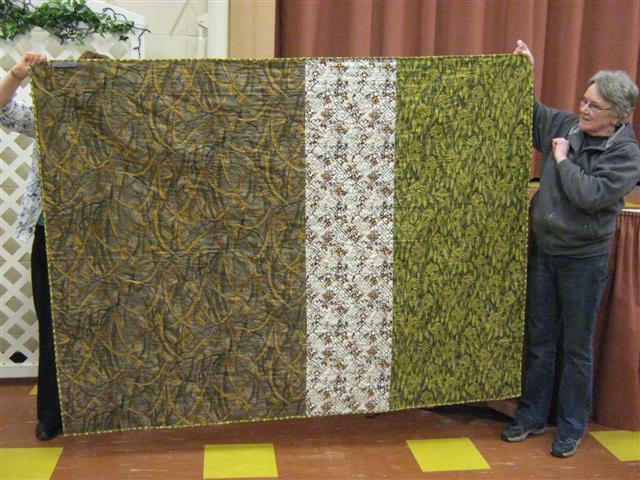 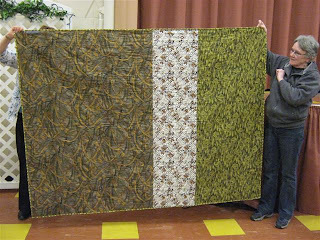 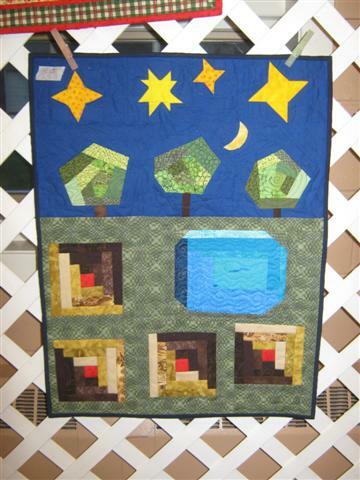 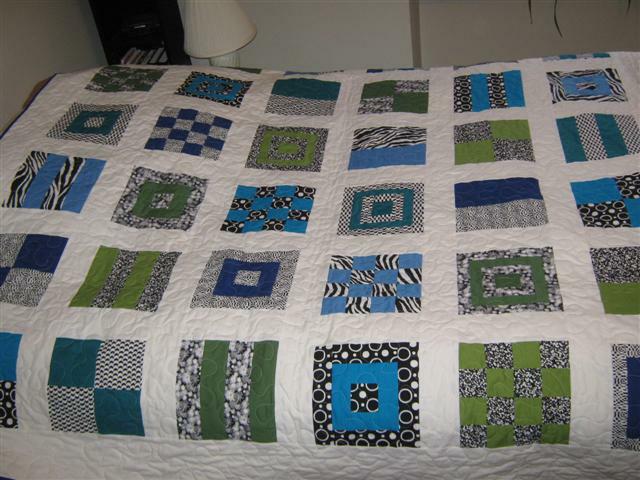 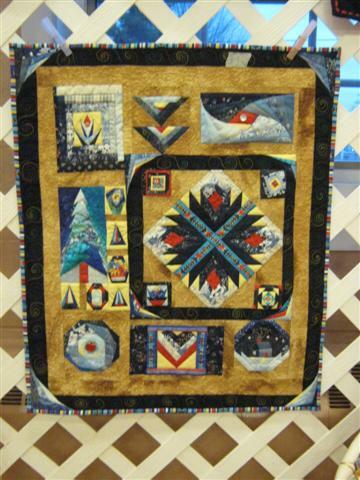 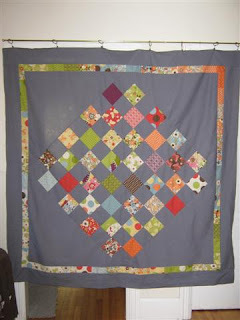 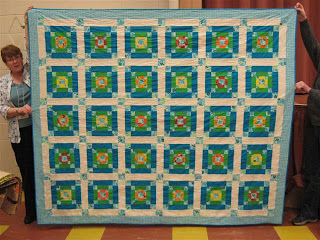 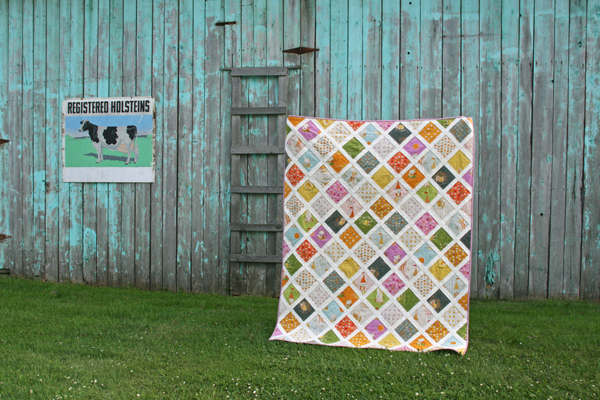 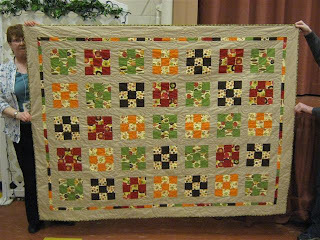 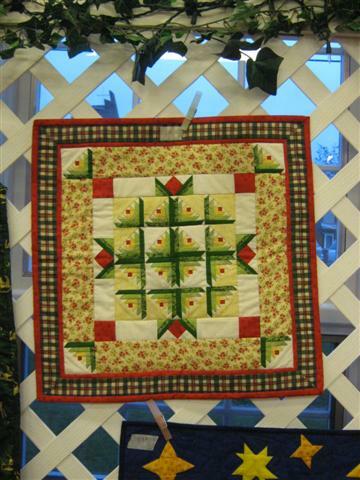 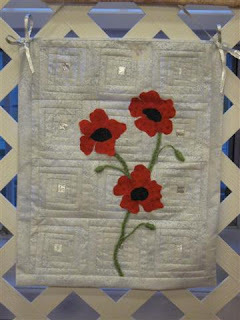 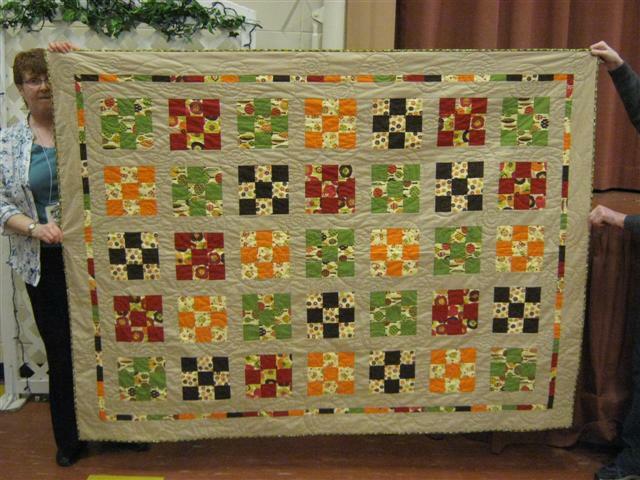 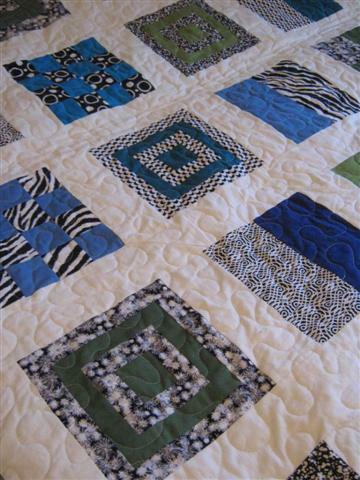 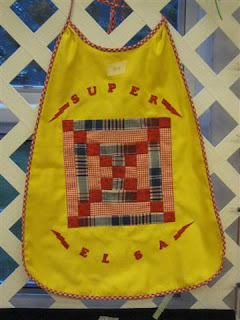 My friend was thrilled to receive this quilt and I know she'll treasure it - what more could a quilter ask for??? 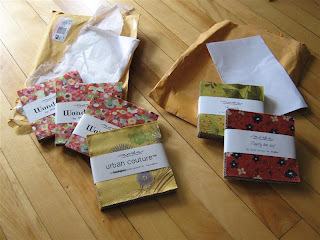 Another finish - makes me happy happy happy :c) My UFO pile is decreasing every week! 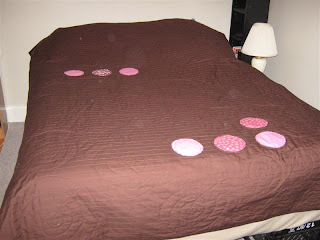 It fits a double bed quite nicely, with sufficient overhang! And doesn't it brighten up a room? 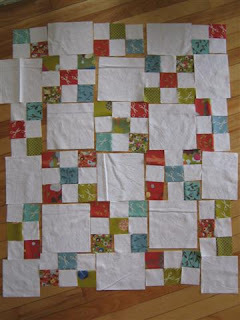 The loopy stuff in the squares you already know from my other posts. 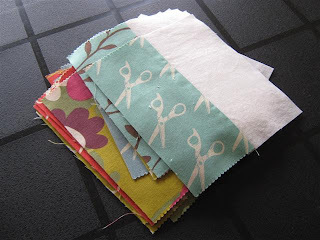 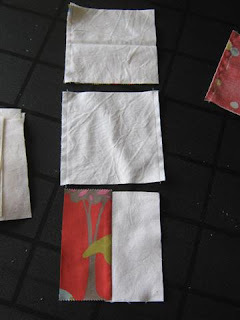 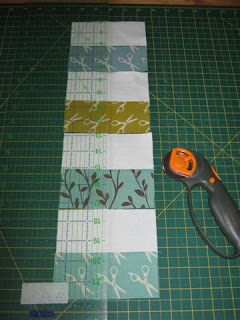 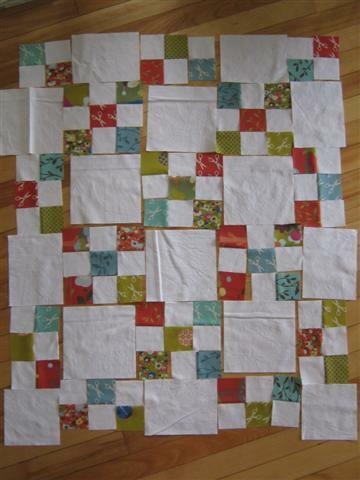 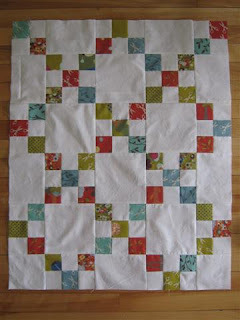 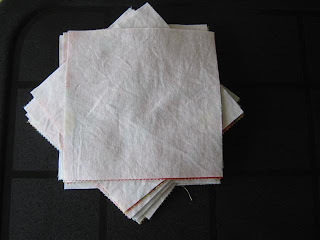 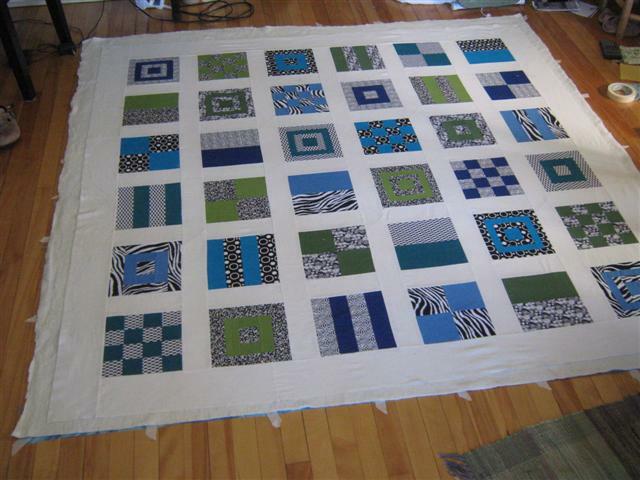 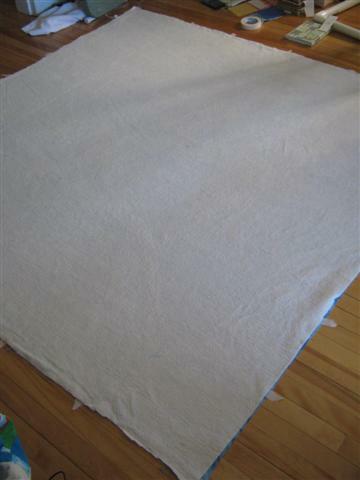 I've also added quilting to the white sashing, though, just a random design, done free-hand in every sashing strip. 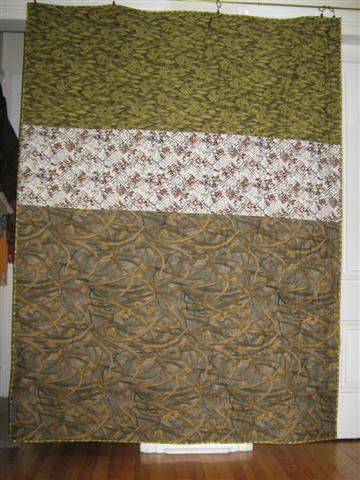 You can just make the pattern out a little bit on the back (a vineyard print in pale khaki-green). 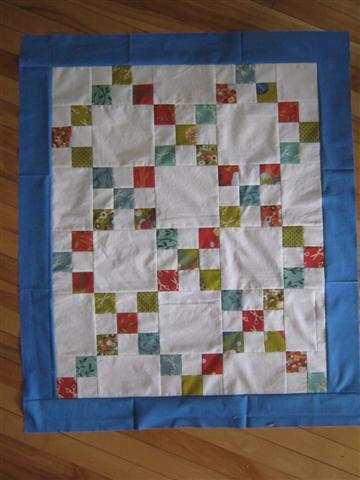 Yay, quilt number two for me! Last night was our monthly guild meeting and it was finally time to reveal all the President's Challenge entries! 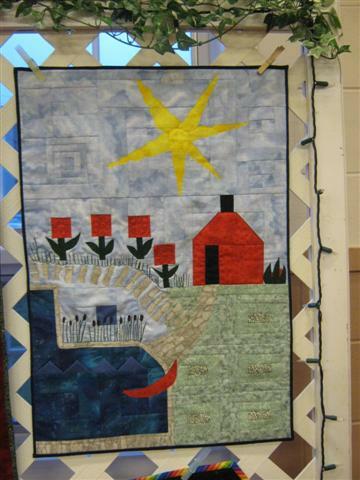 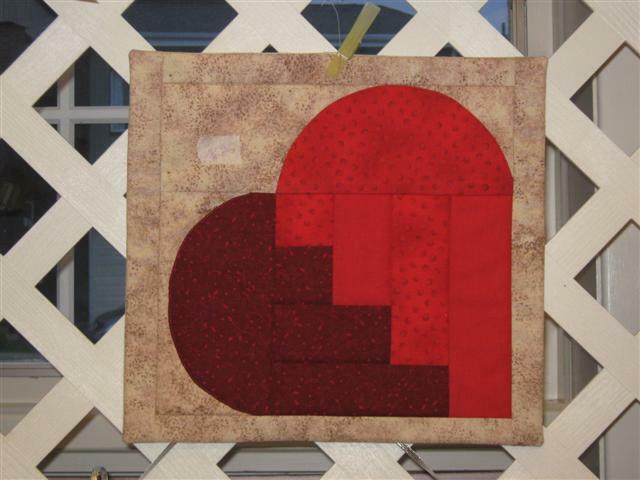 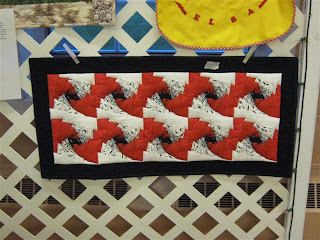 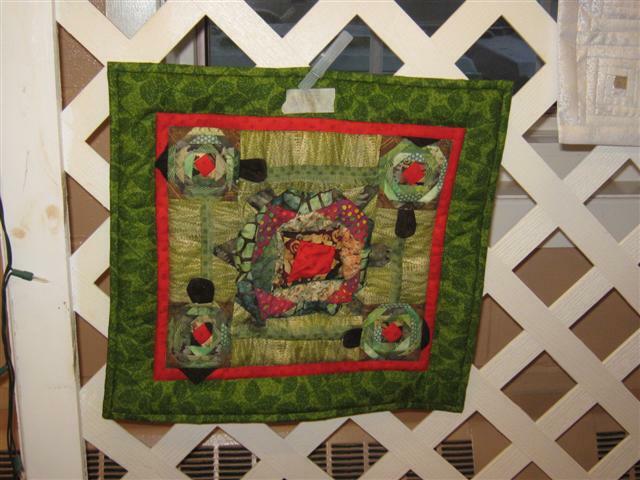 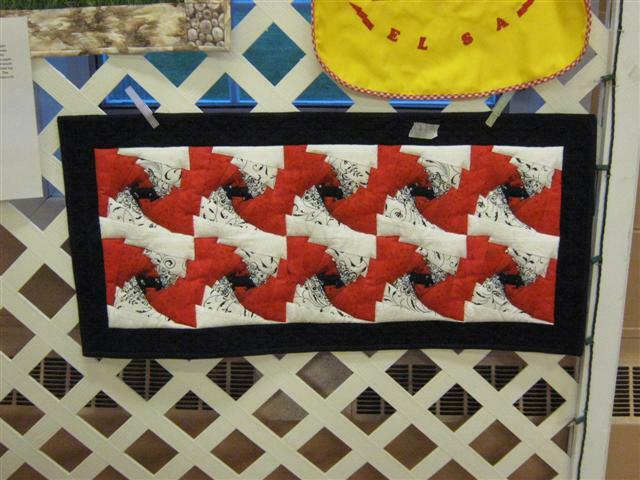 To refresh your memory: in November, participants received a piece of red fabric that was to be incorporated into a small quilt (up to 100" circumference in any shape), primarily constructed of log cabin blocks (traditional, wonky, variations). 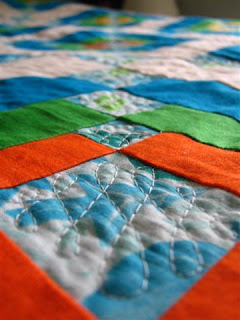 In June, we will find out the winners! I thought it'd be fun to have our own online vote, so why don't you copy the categories into the comment form and let me know what your favourites are! I'll put a number above each quilt to make it easier! 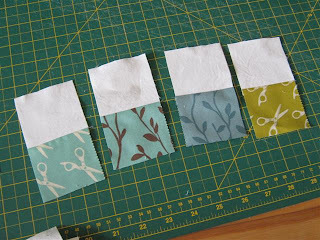 I'm so curious to see what you vote for compared to the guild's results! 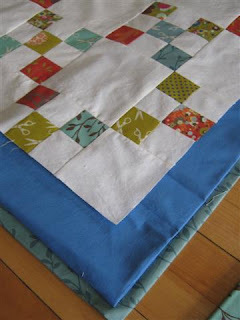 I'll post on that next month! 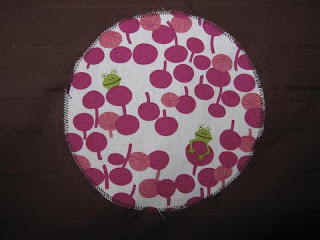 Then I sewed each pair together on two opposite sides, and sliced them down the middle to get these half 'n' half squares. 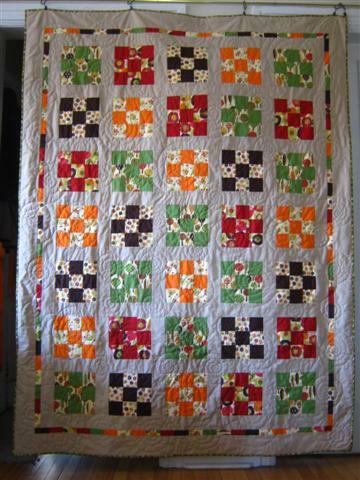 I laid those out in random 9-patch patterns to get an Irish chain design. 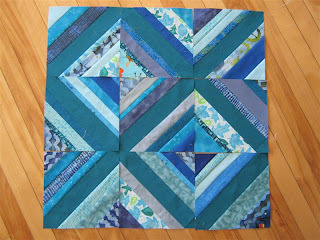 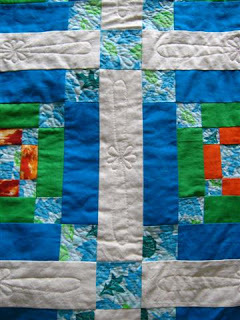 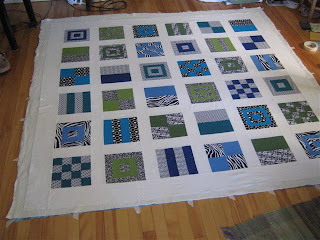 I don't like constructing Irish chains purely out of complete 9-patch blocks, because the chain always looks so cut off around the edges of the quilt, but using the QSRs, I could just stop at a natural junction in the chain by having some 4 patches in the corners and 2/3 of a 9 patch around the sides. 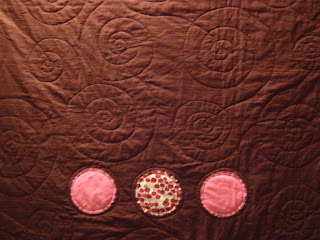 I'm happy with that and it was easy to do.